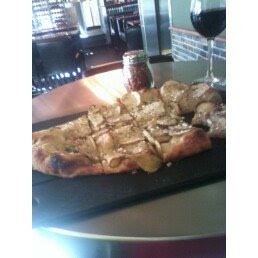 Feeling a bit blue, took myself out to lunch at Serious Pie and found solace in the great Yukon potato pizza. The roasted potatoes and the ever-so-crispy crust combined for a one-two texture treat. This pie had the right amount of char, not too much, just enough. And the glass of sangiovese went well with the olive oil base creation, chopped rosemary on top. I was so tempted to offer to swap pieces with the single diner seated next to me. Looked as if he had a sausage pie. I asked if they could split one, and got the expected no can do. Still, I've got no beef. Snappy Tomato makes a great BBQ chicken Pizza with fresh sliced Roma tomatoes. My wife likes the Pizza Hut's fresh ingredients" Red Onion, fresh cut bell pepper and other ones that makes a real good pizza. Coletta's in Memphis has a killer BBQ pizza.